Atera Seven Falls (阿寺の七滝) is one of 100 best waterfalls in Japan. It is located Shinshiro, Aichi. It has 7 falls and 26m high in total. 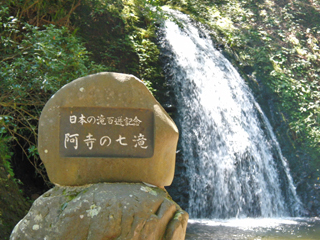 The waterfalls and around nature are chosen as the natural monument of Japan. The legend said that the rocks of this waterfall helps child birth. The waterfall itself is also prayed as the dragon for the raining.